We have already blogged about idioms. If you still remember, "an idiom is a combination of words that has a meaning that is different from the meanings of the individual words themselves". Today we are going to focus on Geography/Weather topics, which are almost an obsession for British people, especially the latter. But is there any special reason for that? To tell the truth, we don't know but the fact is that the weather is extremely unpredictable and wet in the British Isles, that's why 70% of the British check the weather forecast at least once a day and use the idiom "It's raining cats and dogs" so often! Andrea was on cloud nine when she bought her new car. I had to dig deep to find my old report cards. The clothes at the thrift shop are dirt cheap. Lucile is really down to earth for a woman with so much money. I can't talk to Nancy about my boyfriend problems. She's only a fair-weather friend. The kids had a field day at the water slide park. My grades started going downhill when I got a part-time job. Nobody trained me at work. I just went with the flow. I'm exhausted. I think I'll hit the hay early tonight. It's getting late. We had better hit the road. It's hard to keep my head above water with all of these medical bills. Who knows which way the wind will blow? I just hope Jesse gets one of the jobs he's applied for. The car only got a tiny dent. You're making a mountain out of a molehill. The doctor said my heart is doing better, but I'm not out of the woods yet. I knew I was over the hill when I started needing glasses to read. Whenever I had a dance recital, my older brother always rained on my parade. They didn't bother inviting Charles to the party because he's alway a stick-in-the-mud. Wow! Your shower was as quick as lightning. The lost tickets were just the tip of the iceberg. I'd love to go out for dinner, but can I take a raincheck? I was feeling under the weather so I went back to bed. If my Dad finds out I had a party I'll be up the creek. The skiier in the green coat won by a landslide. My Dad has a new girlfriend. I got wind of it over dinner tonight. You have read this article ELT / Geography / idioms / weather with the title Geography & Weather Idioms. 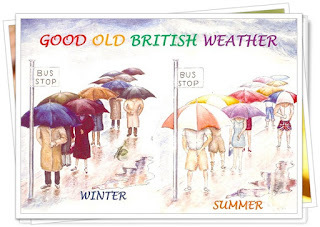 You can bookmark this page URL http://catolink4.blogspot.com/2012/10/geography-weather-idioms.html. Thanks! No comment for "Geography & Weather Idioms"